Meals that I made when I moved into my first apartment stay in my memory and remain my favorites. Frying up an omelet and adding anything I had on hand– caramelized onions, tomatoes, sometimes even corn or black beans– was a sign not just of creativity but of independence. Being resourceful meant that I was making it on my own. Soon, I began to cook recipes from home. I replicated the Pennsylvania Dutch Corn Chowder that was always served steaming hot at the annual Hay Creek Festival down the road from my parents’ house, and I remembered home. I followed my mom’s manicotti recipe, and I remembered home. I flipped through the pages of the Better Homes and Gardens cookbook with its red-and-white checkered cover and thought of my mom following so many of its recipes. It’s good to be independent, and it’s good to keep memories of home very close. It’s good, too, to make memorable meals of your own, like the Tomato Spinach Pasta I discovered in those early days away from home. This recipe combines fresh tomatoes and spinach, toasted almonds, and savory Gorgonzola. If you’ve canned some tomatoes or bruschetta tomatoes of your own, using them will speed up your prep time. Served over warm penne pasta, it’s a classy dish, easy and yet perfect for company. Meanwhile, in a large skillet cook onion and garlic in hot oil over medium heat until onion is tender. Cook and stir over medium-high heat about 2 minutes or until the tomatoes are warm and release some of their juices (be careful not to overcook--the tomatoes should taste fresh and not saucy). Stir in spinach; heat just until the greens are wilted. 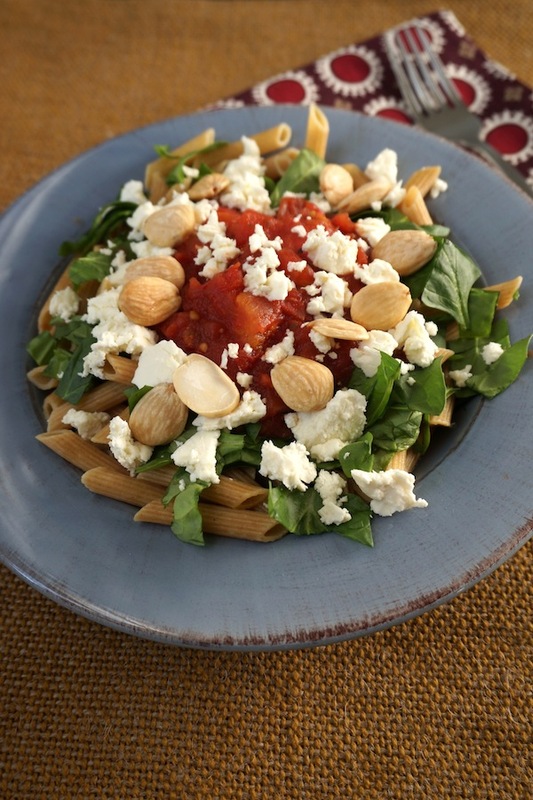 To serve, top pasta with tomato mixture; sprinkle with toasted almonds and cheese. These days, my mom and my sister make this recipe too. It’s so good it has caught on and become a new family tradition. Even though I still live far away, when they make this recipe they can think of meals we’ve shared. Some nights, I make recipes they’ve given me while they are making recipes I’ve shared with them. I like to think that, across a distance of 700 miles, we chop, simmer, stir and sit down to eat in sync.